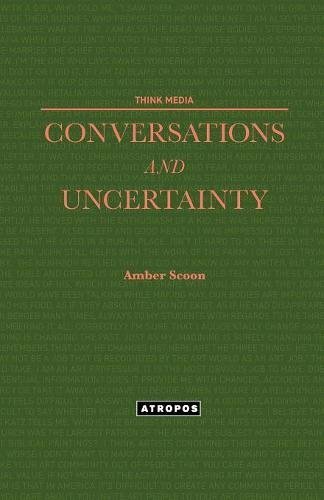 Conversations and Uncertainty contains ten essays. The book is inspired by a life changing conversation with John Berger. Each essay was provoked by a conversation with an artist, writer or thinker including: John Berger, author of Ways of Seeing; William Kentridge, winner of the 2010 Kyoto Prize; Louise Bourgeois, 1981 Fellow of the American Academy of Arts and Sciences; Nicholas Carone, founding faculty member of the New York Studio School and Paul Salopek, two-time Pulitzer Prize Winner. The conversations provoke questions about uncertainty, violence, communication, drawing, the unmeasurable, childhood, magic, theory, checking, newness and the Anthropocene. Conversations are observed along with the thoughts, images, memories, drawings and objects that surround them. In conversations with John Berger, drawings and texts are sent through the post. Sometimes, a conversation is as brief as a scent that surprises us and then disappears before it can be recognized. Sometimes, the author observes conversations that are continuous and deliberate and interwoven into daily life. In each case the observations are based on lived moments. They are without proof, record or measure. They gather into a steady, strong swell and then recede into an imperceptible hum. They mimic each other, each time returning slightly altered. These essays are written in the spirit of giving ideas, images and relationships space to be unknown. Certainty is demanded of us, in our every day life, with such relentless vigor that we respond continuously with packages of certainty. In conversing, reading, writing, thinking and making art, we have a choice. We can allow ourselves to bask in the deliriously disorienting and gorgeous confusion of this mysterious world.